Is democracy backsliding and in retreat worldwide, or are we witnessing a healthy course correction in which people are holding elites and institutions accountable for their performances? 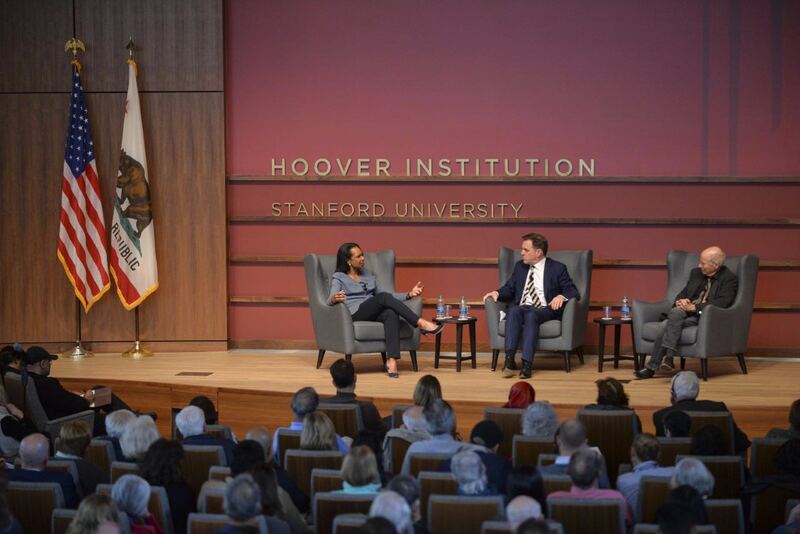 Hoover senior fellows Condoleezza Rice, Niall Ferguson, and Stephen Krasner yesterday touched on that question in a wide-ranging discussion on the challenges to global democracy and American foreign policy during the past century. The session, “One Hundred Years of Democracy and Foreign Policy,” took place in Hoover’s Hauck Auditorium with a capacity crowd in attendance and CSPAN filming. To commemorate its centennial, the Hoover Institution has launched a lecture series, A Century of Ideas for a Free Society, that kicked off with the March 26 session and will continue through the end of 2019. In her introductory remarks, Rice, who was the moderator, noted how people and materials associated with the Russian revolution and the end of World War I factored into the Hoover Institution’s origins. On today’s global political issues, she raised the specter of what she calls the ‘Four Horsemen of the Apocalypse’ – populism, nativism, isolationism, and protectionism. Once you have a democracy, Rice noted, it is difficult to maintain and protect. She asked Krasner and Ferguson if the world was in a “democratic recession,” as Hoover senior fellow Larry Diamond has written about. Ferguson replied that he’s not too worried about a democratic recession, “Roughly half the world’s people live in democracies,” he said, adding that stable democracies account for about 74 percent of world’s GDP, while authoritarian states, like China, make up for 22 percent. “Illiberal” nations are not good for prosperity, he said. Ferguson also said he’s much less worried about populism, and said that it and protectionism are rather healthy checks or reactions to political and institutional dysfunction in societies. At one point, Rice asked if peoples’ lack of faith in American institutions—except the military, which today enjoys high poll ratings—indicates a possible weakening of American democracy. He said the military learned important lessons from its experience in the Vietnam War, and has successfully evolved, while “the media have lost it and lost it badly.” He pointed to the widespread angst spread by elites and the media that the election of Donald Trump would result in fascism or even authoritarianism in America. Instead he indicated, the rule of law is operating just fine. Overall, public skepticism of large organizations is a healthy phenomenon, especially when Americans suffered through the 2008-09 financial crisis. Speaking further on authoritarianism in China, which is in the news headlines more than ever, Krasner acknowledged that he’s been predicting the failure of China for the past 50 years, though that hasn’t happened yet, he added. Rice said that while authoritarian leaders and states may more quickly and sternly impose policies on their peoples, often times those policies prove disastrous in the end. An example is China’s one-child policy, which has created a gender imbalance amounting to 34 million more Chinese men than women. Democracies are better at developing policies through consensus, analysis and feedback, a form of gradualism in democracies that Ferguson spoke highly of toward the end of the lecture. With the rapid rise of technology and social media, Ferguson said that people are developing “networks” where they interact in like-minded tribes thereby creating a more unstable public sphere than ever before. Such niche communities drive fake news and extreme views, and identity politics is being encouraged by the tribalism of the internet. The atmosphere is extremely toxic online and is getting more toxic, Ferguson said. Krasner described these networks as “echo chambers,” and suggested that it’s increasingly difficult for people to talk online about the contemporary environment. He said that what makes America successful as a democracy is that it was built on ideas—constitutionalism, the rule of law, elections—and not ethnicities, like so many other countries. As for European democracy, Ferguson said, “British politics is a Jacobin tragedy, where everyone is stabbing each other in the back.” He does not fear a breakdown of democracy anywhere in Europe, but he said these countries are tackling tough problems such as immigration, demographic change, and slow economic growth. In conclusion, Rice asked whether U.S. foreign policy should promote democratic values in other countries and whether those values are universal. On this topic, Ferguson said, the great lesson of the Cold War is that the United States should speak up for universal human freedoms and values when facing a Communist country like the former Soviet Union. The commitment to individual freedom and rights is a foundational element of American society and should be championed to counter the much more repressive worldview espoused by China’s leadership and its Communist Party. “A new Cold War is shaping up,” he said. The Hoover centennial series will feature Hoover fellows examining the most critical issues facing America and the world –individual, economic, and political freedom; private enterprise; limited, effective representative government; and an understanding of the nature of war, revolution, and peace. The next panel discussion, on April 18, is titled, “A Century of Prosperity: Improvements in the Standard of Living, 1919 vs. 2019.” Hoover fellows Terry Anderson, John F. Cogan, Lee Ohanian, and George P. Shultz will participate in the panel discussion. That event will focus on the rising standard of living in the United States in the past century, and the role that free markets, property rights, innovation, and national security have played in advancing such human flourishing. Click here for more information. All of the centennial lectures will take place in Hauck Auditorium. Each is set to begin at 4:30 p.m. and end at 6 p.m., followed by a reception with light refreshments in the Traitel Pavilion. Tickets are free.